All military historians and enthusiasts will have an opinion on Napoleon Bonaparte. The aim of this book is to prepare the reader to come to, or revise, what might be his final verdict on this most remarkable of military careers. The first part of the volume deals with the years of power and influence – the campaigns and the evolution of the Napoleonic age. 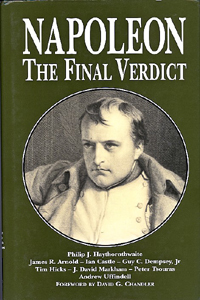 The second part discusses Napoleon as a man-manager and as a strategist, and comments on some of the statements and observations he handed down.